Gretsch Catalina Maple Review: Great Sound Or Fool All-Around? Have you ever wondered if that unique Gretsch sound, which the best and most famous drummers crave for, is really that “great”? In this Gretsch Catalina Maple review, you’ll find the answer you are looking for. The Gretsch Company has a 130 year history and a reputation for crafting beautiful drum kits that create a unique and special sound. Some of the greatest drummers ever, like Vinnie Colaiuta, Tony Williams, and Elvin Jones have played Gretsch drums. Stellar players who are touring and recording in the music scene today, such as Keith Carlock, Ash Soan, and Mark Guiliana, all continue to choose Gretsch drums. Read on to find out exactly why. This is a guest post by Scott Bruyea, a professional drummer with over 35 years of expertise and experience in the world of drumming. You can read more about him here – and I’m hoping that you will read more articles written by him here too. And if you don’t want to rely on my verdict alone, read what Ken had to say about the Gretsch Catalina Maple. you are getting a quality set of drums that can inspire a beginning drummer, an intermediate hobbyist, and even dutifully support a working drummer involved with live performance or recording sessions. a 12” x 8” Tom and 16” x 16” Floor Tom. …the 22” x 18” bass drum. The new design of the Tom mount sports a lower profile and allows for a cymbal stand to be added. 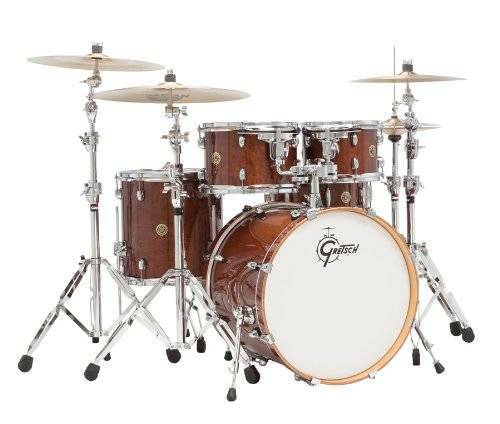 Not only does this Gretsch kit have a quality look with its Walnut Glaze finish, but it sounds great in a way that I can only describe as bigger, warmer, and uniquely Gretsch. 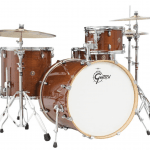 For this Gretsch Catalina Maple review, I analyzed each part of the drum kit thoroughly to see how it compares with other Gretsch kits, or even other brands. 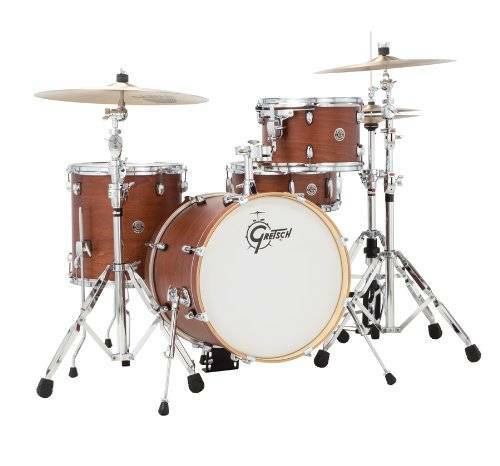 The 30 degree bearing edges on this Gretsch kit are the same as the more expensive Gretsch kits, like the Brooklyn Series and the Gretsch USA Custom. Some drum experts would discount the significance of bearing edge geometry, however, as a former player of Ludwig drums for over 35 years, I hear a tangible difference in sound that is worthy of note. If “That Great Gretsch Sound” is even partially a result of 30 degree bearing edges, then I won’t question it or quibble with the design theory. I just enjoy it! The snare and toms come equipped with 2.3mm triple-flanged hoops and Remo heads and the bass drum is fitted with wood hoops in a matching finish, telescopic bass drum legs with rubber gaskets, and a newly designed low profile tom mount that incorporates a cymbal post hole to take a ⅞” cymbal tube post (not included). The ball/socket 12.7mm L-arms on the tom mount provide tom positioning freedom and a secure hold for stability. The badging on each drum is now the round Gretsch style logo. 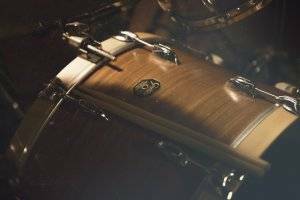 The drums are constructed of 7-ply Maple wood and have natural shell interiors. They are solid, durable, and able to withstand ongoing gigging and transportation and can stand up even longer if kept stationary in a practice space or a studio. 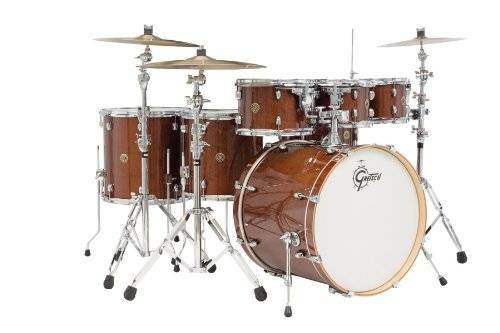 This is what I alluded to at the title of this Gretsch Catalina Maple review, and it is indeed a real thing that took me by complete surprise on the first gig I played with this kit (at an outdoor venue, competing with five other performers on stage). 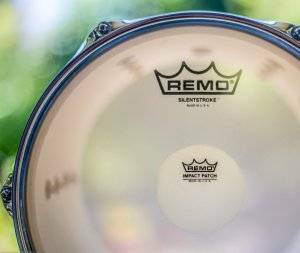 These drums project beautifully and with a warm, round, and punchy sound that can truly impress. The sound is their number one feature and can be reason alone to own a Gretsch Catalina Maple kit. Anytime that you are playing in front of the public, it’s always a bonus to sit behind a kit that radiates class and professionalism. Even at this price point, the beautiful Walnut Glazed finish looks “top drawer” whether performing on a big stage under professional lighting, or in a small dimly-lit club. Both are important factors in a drum kit. After all, you’re hitting these things endlessly. Whether you gig once a month or daily, the Gretsch Catalina Maple kit takes a pretty good pounding. The hardware adjusts easily during set-up and tear-down and tuning is reliable due to the kit’s solid hardware and construction. In my opinion, as a working drummer who uses Gretsch drums, this kit gives you an instant start at sounding great. Regardless of how a drum kit looks, the sound of your drums is of paramount consideration, and Gretsch really delivers a bigger, warmer sound than anything else I’ve played. Early reviews on this kit continue to emphasize how great they sound. I rest my case. However, sound is indeed a subjective feature of a drum kit, so check out this video (using headphones preferably) and judge for yourself. The mounting hardware is solid, easy to manipulate with T Wing wingnuts that are easily adjustable and keeps everything clamped firmly in place. Stability is important when you’re in the middle of a great groove, a solo, or navigating through a challenging part of a drum chart and need to focus. Worrying about cheap hardware loosening and components moving is a total drag. The supplied tom mount only holds the tom using 2 lugs and seems to suspend the tom a little too firmly, therefore, not allowing it to resonate as much as older Gretsch tom mounts that hold the tom using more than 2 lugs. Not a turn-key solution for brand new drummers. This kit is a shell pack which means that you’ll need to add cymbals and related stands as well as a snare stand and a bass drum pedal. Don’t forget you’ll need a drummer’s throne! Q: Does this set include all hardware and cymbals? A: Unfortunately this drum kit does not come with cymbals and hardware. It is a shell pack only. Q: Are these wood finish or a plastic outer wrap? A: The outer finish is a pristinely finished wrap. Q: Does the floor tom come with legs? A: Yes, the floor tom hardware is included as shown in the photo..
For those of you who enjoy having more options for orchestrating your playing, there are great Gretsch kits with additional toms (links provided below) that sport very similar specifications to the Gretsch Catalina Maple 4-piece. With this kit you can stretch out a bit more with your playing using three toms and two floor toms to allow you to get more creative. This kit would be more suited to more experienced drummers playing in a rock band or in a group where more sound options are expected or required. This Gretsch kit carries the Jazz label but could still work in pop or funk bands where that Gretsch sound is what you’re shooting for. This 5-piece shell pack would be a good multi-purpose kit and could also lend itself nicely to playing jazz and country music with a 16×20″ Bass Drum, 7×10″ & 8×12″ Rack Toms, 14×14″ Floor Tom, 5.5×14″ Snare Drum. I have zero affiliation with Gretsch Drums and was always puzzled as to why certain drummers raved about Gretsch, but I have since become a believer in the overall quality of Gretsch. 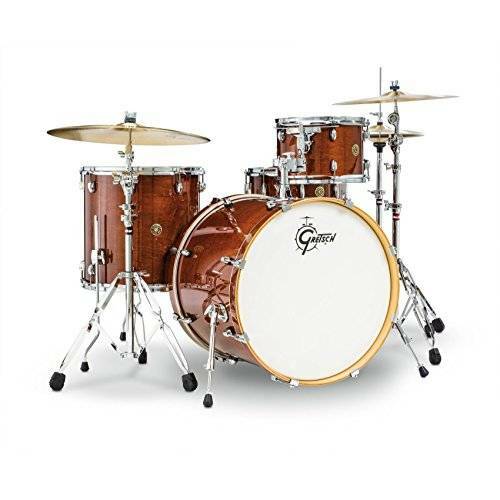 Now, I can honestly say that I, too, love the Gretsch Catalina Maple drum kit. For the price, this kit is of supreme value and will instantly make you sound like a pro and you will look stellar sitting behind them. I have used my kit as a hired gun playing pop music, soft jazz, country as well as pounding out a big sound in front of a festival audience of over 5,000 excited people. So, rest assured, this Gretsch Catalina Maple review is an honest one. These drums are versatile and that opinion comes from the experience of playing them with my reputation on the line. I recommend the Gretsch Catalina Maple 4-piece drum kit highly. I hope this information is useful and helps you during your next drum-kit purchase. We’d love to hear what you think of Gretsch drums and invite you to comment with your feedback, experiences and suggestions regarding Gretsch drum products. I gigged weekends steadily for almost 10 years, spent the next 10 years gigging sporadically, and then “retired” from drumming for almost 20 years. Recently I had an old guy hankering to get back into it a little, and picked up a slightly used set of Gretsch Catalinas Maple. My initial impression of my Cats was simply wow–and a double wow for the price. I started out playing a top-of-the-line 1960s Ludwig kit, and over the years supplemented it with some 1970s Ludwigs, Premier, and Slingerland drums. To my mind these Gretsch Catalinas are every bit as good and possibly better than the drums I used to play–and for a fraction of the price. Adjusting for inflation, these Cats are less than half the price the price I had to pay decades ago for drums no better and probably worse. Yet, now that I have a few months into fooling around with my Cats, I’m realizing that they really are mid- rather than high-level drums. Some of the hardware on them is not top quality and prone to breaking. A bearing edge on one of the drums is rough. It seems to need sanding, but the wood itself looks like it’s the problem. More subjectively, I only have one of the 5 drums sounding great; the other 4 are only sounding adequate in my opinion. Granted, I haven’t experimented with different heads and may not be the best drum tuner in the world, but I’m not in awe of the sounds I’m getting, just satisfied with them. I’ll add that, just me, I don’t care for the Gretsch rack tom mounting system. I’ve seen it over the years and understand that it’s supposed to allow the toms to sing beter, but now that I’m actually using it, I find it too finicky to get the toms set right. OK, once I finally got them set where I want them, I don’t have to fool with the mounting system anymore, but I’d prefer just to have the mounts screwed into the drums the way most toms are mounted. I’m not convinced that the mounting system affects the sound, although Gretsch says it does. Anyway, I think the main plus of the Gretsch Catalinas is the quality/price ratio. When I was shopping, I mostly considered a couple in the Sonor series (3007s and something else I forget) as well as a few kits made by Mapex alongside the Cats. I can’t say that I always liked the Cats better, but I usually liked them at least as well and especially liked them for the price. I didn’t find any drums as good for the same price, and more expensive drums weren’t to my mind necessarily better. I definately agree with this reviewer’s 10/10 price/performance rating, but would personally lower the ratings on hardware quality and sound to around a 7. The question that led me to this review, though, is whether gigging semi-pro drummers like I was would play the Cats. The answer is probably yes and no. The Cats are definitely good enough to play gigs, especially after the drummer plays around with different heads, and a drummer’s big expenditures ought to be on cymbals anyway. Also, gigging can be rough on drums, and a lot of professional drummers use less expensive kits like the Cats for gigs simply because they don’t want their more expensive drums to get damaged. But on the flip side, were I to gig regularly again, I might have a hankering for a slightly better set of drums. Gretsch itself makes higher-end drums than the Cats, and if I could accept Gretsch’s rack tom mounting system, I might look into higher-end Gretsch drums. However, there are other manufacturers to consider too, as well as decisions to be made about the wood used for the shells. The decisions actually become more complicated at the higher end–which probably make the Cats a good choice. They’re not complicated, and while they’re not the best, they’re good enough to get a drummer through almost anything. They’re a nice compromise. I’ll add that it does disturb me a little to hear of parents buying their kids these drums to start learning on as beginners. These drums are too good for beginners. However, they’re cheap enough to justify buying over a lousy beginner kit, and as I recall, I myself went from a practice pad to top-of-the-line Ludwigs (albeit only a 3-piece kit) when I was a kid. I guess this is what the intermediate level of drums is about. They’re good enough for pros, but cheap enough to give beginners drums they can grow into. Personally, I’m pleased with my Cats. The wow factor has subsided, but realistically the Cats are about the right quality level for me. I’m glad I bought them instead of really cheaping out and cobbling together a set with unmatched no-name drums picked up randomly (a strategy I strongly considered), and glad I bought them instead of overpaying for higher-end drums I don’t play well enough anymore to appreciate. The Cats fall nicely in the middle range, and are very cheap for the quality you get in that middle range. Thanks so much for this comment! This is a review in itself and should be read by everyone coming to this page as I’m sure it will be helpful to people interested in the Gretsch Cataline. I’ll include a bolded link in the article, so everyone becomes aware. Thanks for your comment! Sounds like a plan – as you will know from the review, I’m very much in favor of the Gretsch Catalina Maple 7-piece kit. Let me know how you decide! I was a little disappointed with the tone of a couple of toms too. They just kind of sounded dead and I thought I made a mistake buying the Catalinas or got a lemon set. Then I ran across some abstract comment by someone with the same issue who said a simple change made all the difference. So I tried it and it brought out more punch and resonance. Assuming you have room to do it, simply turn you L-Bracket over to point down instead of up and mount the tom. The theory is that the weight of the tom isn’t transferred to the bend in the L-bracket and the rubber ball (which absorbs impact) and is instead transferred to a smaller portion of the hardware where the impact isn’t absorbed in the same way and lets it ring more. I dunno how true this is… I’m not an engineer but damn it did make a difference. Costs nothing to try it. Awesome, thanks so much for that, Steve. I’m sure this will be hugely helpful for all readers considering the Gretsch Catalina – so I will link to your comment from inside the article.